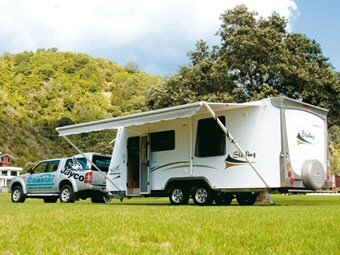 The Jayco Sterling 21 Series models are medium-sized caravans by Australian standards, built to travel vast distances over average to rough roads and to last 20 years plus. 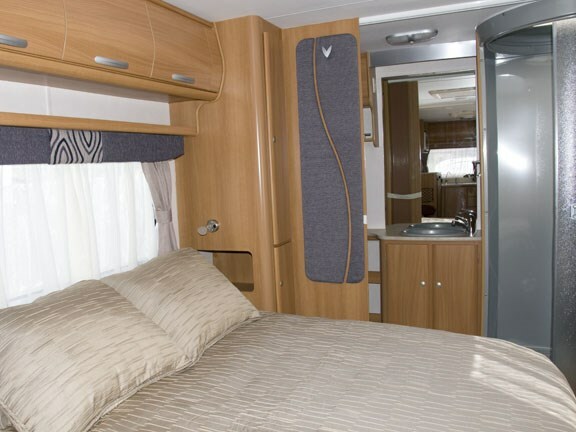 There have been several interior and exterior changes on the Jayco Sterling. The new model features a neat layout, with the kitchen across the front and bathroom across the rear. The attention to detail in the ensuite bathrrom rivals the best Europe can offer. 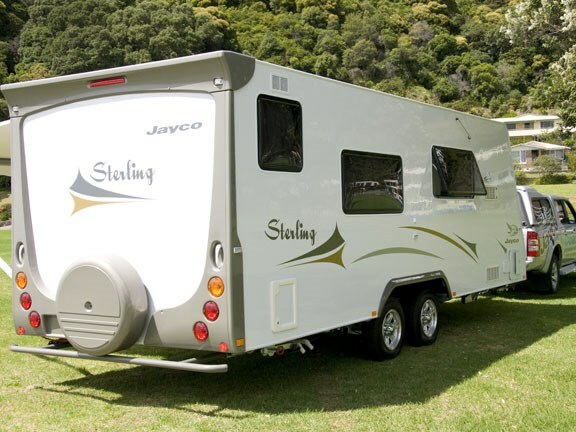 The Jayco Sterling will need a robust tow vehicle. 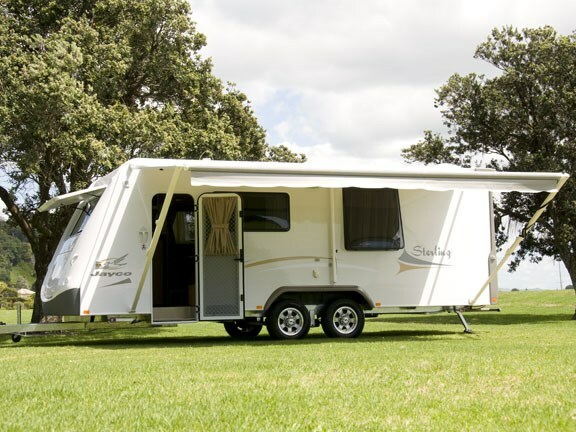 The Sterling has a full-length Jayco Millenium galvanised steel channel chassis over twin axles, with the proven rocker type leaf spring suspension and supported by four robust galvanised Alko corner steadies. The LPG pipes are plastic sheathed, electrical wiring is in plastic conduit and the water tank bottom has sheet metal protection. 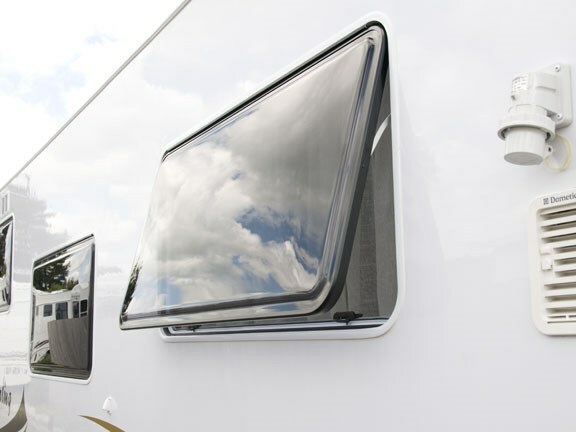 Up front, a hinged fibreglass cover, which becomes a shade awning when opened, protects the front window. 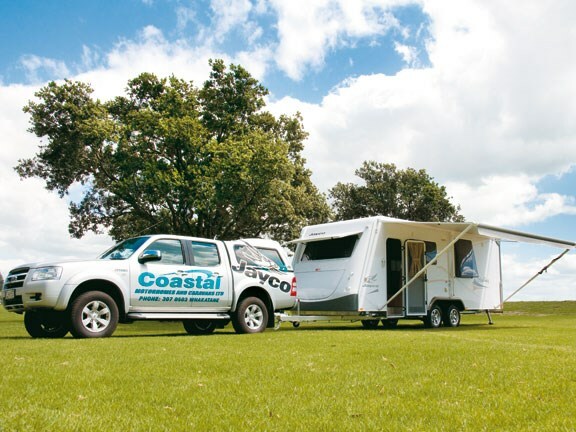 The tow hitch has twin safety chains and the Sterling is fitted with the latest electric BrakeSafe equipment that applies the brakes to all caravan wheels should the caravan and tow vehicle part company. Outside there have been some changes from the previous model. Both the front and rear mouldings and the LED taillights are new designs, as are the 14-inch alloy wheels and the wheel arch trims. The feature I liked best was the new external door. With its rounded top corners and window glass set flush with the door cladding, it looks very sleek. The Sterling retains the front locker houses two 9kg LPG bottles with the associated LPG regulator and bottle selector switch permanently mounted on the locker wall. 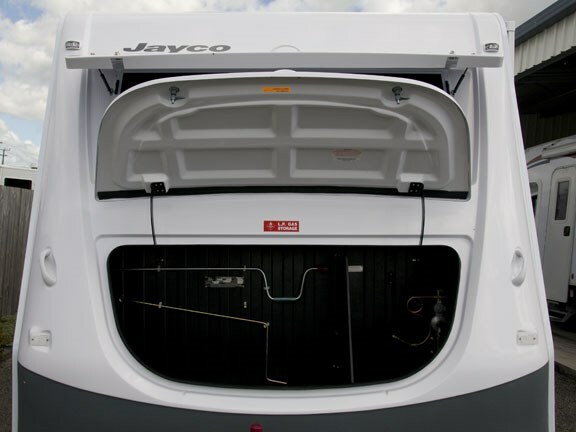 Jayco has a neat lockable, lidded, sidewall fitting for fresh water service to its caravans. It consists of a mains pressure hose connection that saves using your water pump, and also has hose openings to allow two separate fresh water tanks to be filled. The huge, five-metre Carefree of Colorado awning is designed so that it can be raised and lowered safely by one person in windy conditions. There have been several changes to the interior. New-style overhead lockers, the curved doors have new handles with an improved latching mechanism, new style pelmets are covered with fabric matching the upholstered wall, and concertina doors that close off the bedroom area now fold into recesses in the walls when not in use. Jayco has installed a new flush-mounted range hood model tucked up under the overhead locker above the oven, which is a new model SMEV with one electric and three gas hobs, a separate grill and oven compartments. In an overhead locker next to the microwave is the electronic control centre with tank monitors for both fresh and grey water, the switch for the hot water system, the battery on/off switch and the 240-volt RCD switch and circuit breakers. The 12-volt fuse box is in the front of the dinette settee, in behind panel is the Setec 35 electrical controller. At its heart is a transformer controlling both the 240-volt and 12-volt systems. 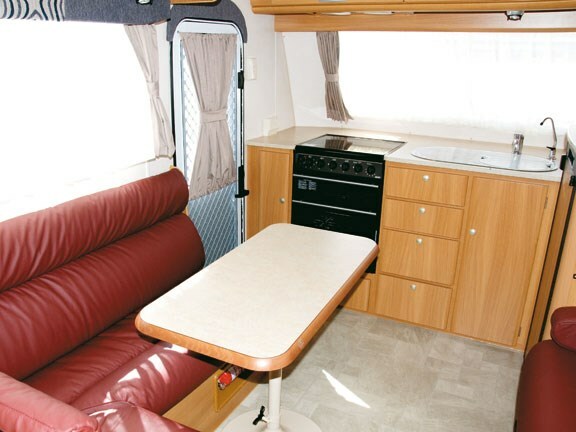 The dinette seats three comfortably – four at a pinch. Closing the concertina divider to the bedroom will give you complete privacy. The 1320mm x 1830mm slat bed has a fully sprung mattress and can be lifted with gas-strut assistance to access storage underneath. At bedtime, the bed length is increased by pulling it away from the wall. The top shelf in the adjacent locker now also serves as a bedside shelf. 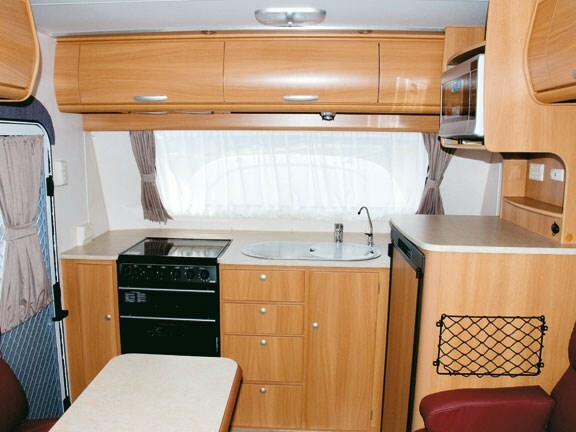 There is plenty of storage available, and the lighting and ventilation appear to cope with all situations. There is a wall-mounted arm for an LCD TV at the foot of the bed. The en-suite bathroom across the end of the Sterling is well appointed with a separate silver-grey circular shower module with a sliding door, its own fan hatch, and ceiling light. The matching silver-grey basin is set into a cabinet top with cupboards beneath and shelves alongside. 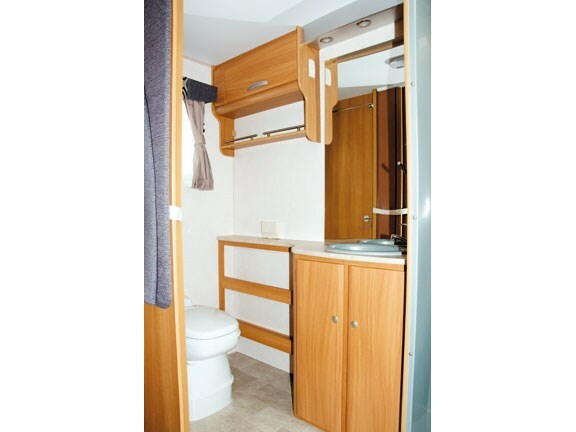 The Thetford C200 cassette toilet is tucked away behind a partition to the left of the vanity. There is a dedicated space for a washing machine beside the toilet. The Sterling has a tare weight of 1971kg and a GVM of 2446kg. It needs a robust towing vehicle such as Commodore or Falcon, a Hilux or Navarra turbo-diesel pick-up, or a three-litre 4WD. On the short test run I found the Sterling was stable, cornered in a predictable manner and was a breeze to back up and park on tight sites. To read in-depth motorhome and caravan reviews, see the latest issue of on sale now at all good retailers or subscribe to Motorhomes, Caravans and Destinations magazine here. 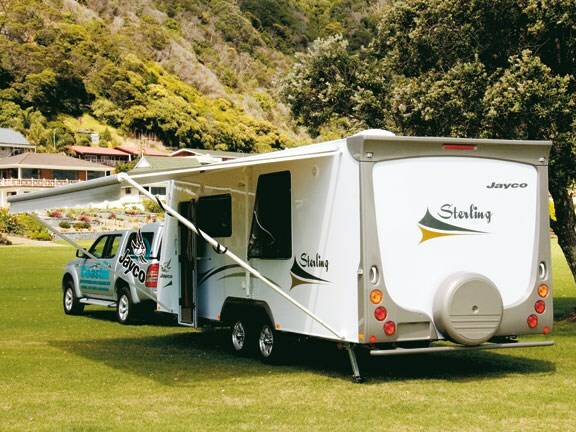 See new and used Jayco Sterling caravans for sale here.